Daniel J. Murphy - dmurphy@shawmedia.com Carolyn Martin of Crystal Lake receives a lung check from Dr. Michael Lesser Wednesday March 14, 2012 at Family Health Partnership Clinic in Woodstock. Dr. Lesser volunteers a half a day every month Family Health Partnership. 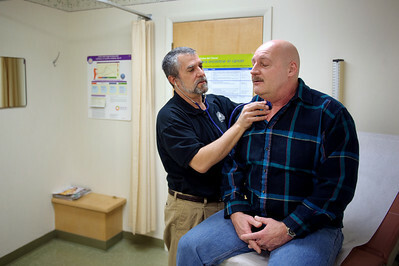 The clinic specializes in the care of uninsured patients. Daniel J. Murphy - dmurphy@shawmedia.com Family Health Partnership Clinic nurse Alma Toranzo draws blood from Judy Gruner of Woodstock Wednesday March 14, 2012 in Woodstock. Daniel J. Murphy - dmurphy@shawmedia.com Dr. Michael Lesser visits with Judy Gruner of Woodstock Wednesday March 14, 2012 at Family Health Partnership Clinic in Woodstock. Dr. Lesser volunteers a half a day every month Family Health Partnership. 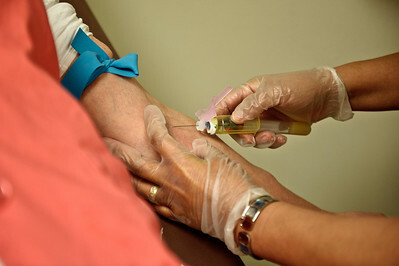 The clinic specializes in the care of uninsured patients. Daniel J. Murphy - dmurphy@shawmedia.com Bob Scholberg of Richmond receives a lung check from Dr. Michael Lesser Wednesday March 14, 2012 at Family Health Partnership Clinic in Woodstock. Dr. Lesser volunteers a half a day every month Family Health Partnership. 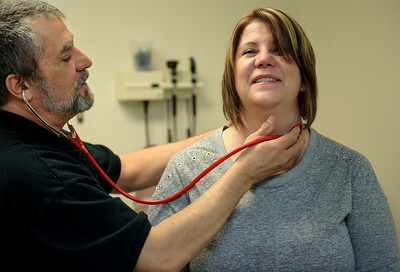 The clinic specializes in the care of uninsured patients. Dr. Michael Lesser visits with Judy Gruner of Woodstock Wednesday March 14, 2012 at Family Health Partnership Clinic in Woodstock. Dr. Lesser volunteers a half a day every month Family Health Partnership. 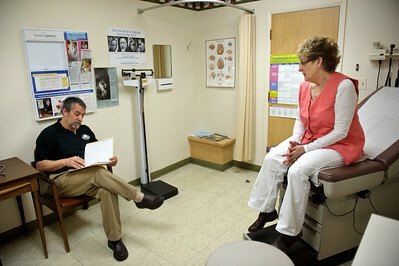 The clinic specializes in the care of uninsured patients.